I specialise in theatrical release movie posters that have either been displayed in cinemas, or were produced for cinema display - not to be confused with mass-market souvenir type reproductions that typically sell for a few pounds and are commonly available. On this page you'll find useful information about the posters, together with various science fiction website links and even a few book recommendations for real poster/sci-fi fans! This guide lists some of the main original movie poster sizes. Please note that these posters are all original authentic movie posters - not to be confused with reproductions or 'souvenir' type posters commonly found in shops. These are the actual cinema posters that were used at the time of a movie's release. The Quad, or 'Quad Crown' to give it its full name, comes from the early theatrical 'Crown' format which measured 15" x 20". Doubled it became a 'Double Crown' measuring 30" x 20" and quadrupled it became a 'Quad Crown', since abbreviated to Quad. Unique to Great Britain and very popular with collectors, the quad poster has stood the test of time and for many is 'just right' - its landscape format complementing that of the cinema screen. Quads were normally supplied folded until around the mid 1980s. The US One Sheet, standardised since 1910 at 27" x 41" started to switch its size to 27" x 40" during the 1980s. Variations include a rarer wider version measuring 30" x 40" printed on thin card stock. One Sheets were typically supplied folded until around the mid 1980s. The One Sheet movie poster format has an elegance all of its own. The US Half Sheet is a landscape format produced on thin card stock. Generally rarer than their full-size counterparts, the Half Sheet is very collectable and easy to display. The Japanese B2 'Hansai' format is a portrait format that is growing in popularity with collectors worldwide. Up until the 1980s posters were produced on both glossy and matt paper stock, and often the same title could be found on both. Since the 1990s nearly all B2 Hansai posters have been produced on glossy paper. Designs are often intricate, featuring a montage of actual images taken from the movie. I take great care with grading in an effort to give a true representation of a poster's actual condition. I have very high standards and only sell posters that I, too, would love to have displayed on a wall at home or in the office, or home cinema, and see little merit in selling anything substandard. By offering transparent descriptions, together with a no-quibble 100% money back guarantee, you can shop with total confidence. 1. We take an individual photograph of every single poster that we sell, against a neutral grey background, enabling both light and dark poster borders to stand out. 2. Our photographs are then displayed to scale, so that you can instantly gauge the relative size of each poster. 3. We offer a clear description, including dates and country of origin. For us this can only mean one thing - 100% pristine condition, as new, mint! A perfect 10. Superb condition, virtually mint, smallest signs of handling or age. A poster in exceptionally good condition. A very presentable poster, but one with small imperfections. A presentable poster, but one that has a number of obvious visual blemishes that detract from its overall appearance. Suffers from heavy use, poor storage, paper loss, random tears, excessive creasing. Suffers from very heavy use, major neglect, major paper loss, larger random tears, excessive creasing or worse. Every poster that I sell is individually photographed. In other words the poster that you see is the actual poster that you will receive once ordered. In some photos glass paperweights can be seen. An overlaid watermark 'Sci-FiMoviePosters.co.uk' appears on photos (but not on the actual posters of course!). All posters are shown to scale. If there's a particular poster that you are interested in, and you would like to see an even larger photo, simply email the Item Number and I will email you a larger image. UK orders are sent via Royal Mail First Class "Signed For" or Special Delivery. You will be notified by email when your order has been despatched. All European Union orders are sent via International "Signed For" air mail. You will be notified by email when your order has been despatched. For the rest of the world we send via International "Signed For" air mail. You will be notified by email when your order has been despatched. All orders are charged as follows: £6.00 for the first poster + £1.00 for each additional poster. All orders are packed with the utmost care using only the very finest shipping materials. The typical 1.5mm to 2.5mm walls found in most British postal tubes simply don't meet our standards, so we have our postal tubes custom made for us, featuring a 6mm (1/4") wall. They are incredibly strong and ensure that your order arrives in perfect condition. We think our postal tubes are the best in the world! "I love this poster it is really nice... thanks again." "The poster arrived yesterday, and I’m absolutely delighted with it……. Many thanks." "Just dropping you an email to say thank you for a pleasurable transaction! Poster arrived next day in a very strong tube as described. I wish all transactions went this smoothly." "Poster here safe & sound, thank you." "...I bought another poster for my son (who collects them) some months ago. It was a Star Wars ESB advance poster and it was wonderful, so thank you." "Just had to send this email to say thanks for the poster which I received today. Exactly as described, speedy service and fantastic packaging." "The poster arrived safely and in excellent condition. It's currently at the framers, can't wait to hang it." "Poster landed and is fab. Great packing too." "Just to let you know that I got the poster today and you made a 42 year old man cry. I can't thank you enough. It's beautiful." "Many thanks for the fantastic poster." "Arrived today - really excellent items - very pleased. If for any reason you are not delighted with your purchase please let me know upon receipt via email. All sales are covered by a full 21 day worldwide 100% money-back guarantee. Posters should be carefully packed in their original (undamaged) packaging and returned via a 'signed for' delivery service. Upon receipt I will issue a full refund (including the cost of your return postage) and will follow this up with an email, to make sure that you have received your refund, and that all is well. Since launching in 2008 I haven't had a single unsatisfied customer. Analog - Science Fiction and Fact. Asimov's - Asimov's Science Fiction. Brampton Picture Framing - We have used, and recommend, Brampton Picture Framing. Clarkesworld Magazine - Monthly science fiction and fantasy magazine, first published in October 2006. Empire - Film reviews, movie news and interviews. National Aeronautics and Space Administration (NASA) - Science fact. Sci-Fi-London - Dedicated Sci-Fi and Fantasy Film Festival, London. SFX - The world's number one Sci-Fi and Fantasy magazine. Starship Modeler - Resource for the science fiction, factual space, fantasy, mecha and anime scale model builders. Total Film - Film news and movie reviews. If you have a science fiction related website and would like to exchange links please email, via the Contact page. Sci-FiMoviePosters.co.uk link banner: Click Here. Suggested link text: "Sci-FiMoviePosters.co.uk - Authentic Science Fiction Cinema Posters"
Do movie posters represent a good investment? I think so - but I guess I am a little biased! This collection took many years to build. I'd always recommend owning an original movie poster for pure pleasure first and foremost, but in actual fact they can make excellent investments. It is relatively easy to purchase titles that are already highly regarded; what is perhaps more of a challenge is to try and second-guess which titles will become sought-after by collectors in the future. Sometimes a movie can take a number of years to 'mature' before it is recognised as the masterpiece that we all knew it was all along! Q Can I pay by cheque instead of ordering online? A Yes, please see our How to Order page. Q "I've got a question!" A Please send us an email, via the Contact page. We've included a few favourite film poster / Sci-Fi movie books here. The Star Wars Poster Book is superb, as is Sim Branaghan's British Film Posters: An Illustrated History. And for sci-fi movie goers then The Rough Guide to Sci-Fi Movies should be on your shopping list too. Wow! 320 pages of Star Wars posters, covering the main six movies. The world's foremost Star Wars collector, Stephen Sansweet, together with poster collector Peter Vilmur, go behind the scenes with stories from both artists and designers. Featuring hundreds and hundreds of posters in full colour, a 'scarcity' guide to over 2,000 Star Wars posters, and a bootleg identification guide. The Star Wars Poster Book is simply stunning. 320 pages 9½" x 12" Hardbound. British Film Posters is the first complete history of the subject ever published, covering every aspect of design, printing and display, and including detailed biographies of all the major artists. The full story of illustrated film posters in the UK is discussed, from their emergence in the late Victorian period as an offshoot of the variety/theatrical posters of the period, through to the rapid decline of the illustrated (painted) poster during the mid-1980s in favour of the photographic poster. Painstakingly researched by Sim Branaghan this book brings to life the fascinating story of the British Film Poster. This is a superb book, fully illustrated with numerous photos and posters, and plenty for the sci-fi movie poster collector too! 304 pages 8" x 11" Softbound. Drew Struzan's talent for capturing what is both human and heroic in the face of a movie character has made him the top Hollywood film campaign artist for the past 30 years. Struzan has created the images for some of the biggest and most successful box office hits in cinematic history, including Sci-Fi classics Back to the Future, Star Wars, ET and Blade Runner: The Final Cut. 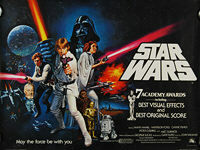 This compilation of his cinematic art, accompanied by text explaining his particular vision of each character, features a foreword by the director George Lucas. 120 pages 9½" x 12" Hardbound. From Metropolis to Godzilla and Invaders From Mars to Star Wars, science fiction movies have peopled our universe, and others, with some of the studios' coolest creations - including a vast range of aliens, robots, bug-eyed monsters and spacecraft. Considering the visual richness of the subject matter, it is no wonder that successive generations of the most talented illustrators, painters, art directors and designers, all with imagination to spare, have signed on to produce posters for science fiction films. Their creations not only provide us with a record of how they and their contemporaries saw the future, they also serve as a visual running commentary on all that has happened in graphic design since Lumière invented motion pictures. The images in this book show just what has been luring audiences into the cinema from 1902 to the present day. 192 pages 10" x 12" Softbound. The Rough Guide to Sci-Fi Movies is a comprehensive guide to the 'final frontier' of film. It explores our fascination with space exploration, time travel, fantastical worlds and alternative futures. This guide explains how everything from the philosophy of Plato to classic Victorian tales and cult comic books have helped to create one of cinema's most engaging genres. Discover the classics from Mexico, Russia and Japan, not forgetting the Anime science fiction tradition, along with everything else you need to know from Metropolis to Star Wars, via Blade Runner, 2001 and Alien. The Rough Guide to Sci-Fi Movies is an essential guide to a galaxy of film, unbounded by time or space. 326 pages 7" x 7" Softbound.